First Tactical just keeps kicking out some of the best gear I've tested, and the company's new Defender series combat shirt and pants are no exception. My examples arrived in classic OD green and I was eager to rip off the tags and put them to the test. My first impressions of both the shirt and pants were very positive so I'll go from the top down and get you up to speed one item at a time. Designed to be worn under armor, the Defender combat shirt is what I would call a hodge-podge of a few different shirts, but in a very good way. 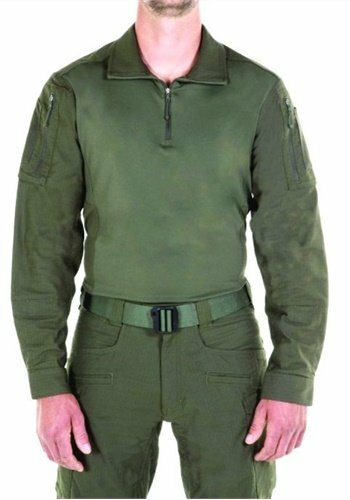 First Tactical basically took the best parts of a traditional BDU blouse, a modern combat shirt, and a uniform shirt and combined them into a very functional, exceptionally rugged, and amazingly comfortable piece of tactical apparel. The sleeves, shoulders, and collar are the most rugged components of the shirt, and for good reason, as they'll be exposed to the most wear and tear. Constructed of a 7-ounce blend of cotton and Cordura nylon rip-stop fabric, they are thick and reinforced at the elbow with a built-in pocket for elbow pads. Add a wide Velcro strap closure at the wrist, large YKK zippered upper arm pockets with a loop patch panel, and channels for pens or other small items, and you get a very utilitarian platform that'll protect your arms as well as carry all your stuff. The zip-up collar is tall and equally rugged but has a short section at the back of the neck made of elastic jersey material to allow air flow and accommodate a wide range of motion. This is a nice touch not usually included in a combat shirt. If you want a more uniform appearance, every Defender ships with a set of epaulettes that can be easily sewn on. 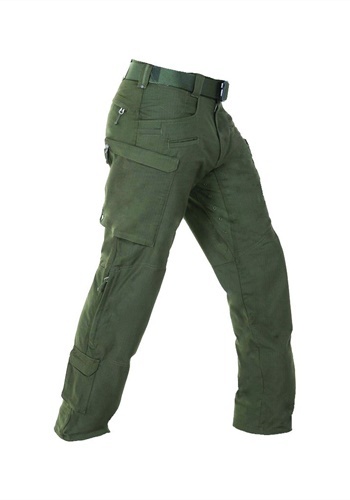 Complementing the shirt is the new Defender BDU pants. Constructed of the exact same 7-ounce cotton and Cordura nylon fabric as the shirt, these pants are a perfect match and about as solid as a pair of BDUs can be, with triple stitching at every seam. To maximize airflow through this bullet-proof fabric are a series of embroidered grommets down both sides of the gusseted crotch and behind both knees. The waist is double-layered for durability but also has a bit of stretch for comfort, and the YKK zipper closure at the front will keep everything secure with both an interior button and exterior Prym snap. The Defenders have seven wide belt loops and every other one is riveted and ultra-reinforced so not even the heaviest duty belt should pose a problem. The body of this shirt is the yin to the sleeves' yang. Here is where breathability, not durability, matters most. First Tactical chose a lighter, 100% polyester jersey material that is both moisture wicking and antimicrobial to keep the wearer cool and dry. The main torso has a softer, almost cotton-like feel while the sides are a super-thin compression shirt texture. These materials have an incredible amount of stretch and are both fade and wrinkle resistant. Fitted properly, this basically creates a second skin that will keep you comfortable and won't inhibit your range of motion one bit. As with any good pair of tactical pants, the Defenders have an abundance of pockets for just about everything you'd need to carry and then some. The front main pockets are deep and wide enough for a pistol or rifle magazines. Complementing both are small corner pockets to protect the clip of a pocket knife and two slash pockets perfectly fitted for a 30-round AR-15 magazine, should you choose to carry a couple spares. There's even a small pocket on the right side near the waist just large enough for a couple of batteries or a handcuff key. Moving down to the thighs we have the largest of the Defender's 15 pockets. Each cavernous pocket is secured with a heavy-duty YKK zipper and protected with a short flap across the top. The interiors are not only roomy but include neatly divided organizers sewn into the back to keep smaller items secure and readily accessible. If you want to max out the space you could easily fit a full-size trauma kit in each. As if this weren't enough storage, the Defenders add a few more pockets not found on most traditional BDU pants. At the knees are two large pockets for knee-pad inserts with zippered closures at the sides. This is a departure from other pants I've owned where the pads are inserted through a small Velcro opening at the bottom. The Defenders' version makes inserting and removal of the pads an absolute breeze and is a welcomed innovation. Inside each pocket is a breathable mesh liner to keep your legs cool behind the extra padding. Below the knees are two small pockets with Velcro flap closures the perfect size for a tourniquet or similarly sized items. The rear slash pockets are also quite roomy with flap-covered YKK zippers but sewn internally for a clean, professional appearance. And if you're old-school, both leg openings incorporate thick bungee cords for locking tabs for quick and easy blousing. So far I've worn my Defenders on a variety of missions in the Arizona heat and have found the heavy fabric to be surprisingly breathable. My armor and gear have caused almost no wear and tear so I have confidence these will be part of my kit for a very long time. Available in your choice of black, navy blue, or OD green, the Defender pants come in a variety of sizes sure to fit almost anyone. They run true to size and are cut for a more athletic build; no baggy "fat guy" BDU's here. You can pick up both the Defender shirt and pants directly from First Tactical at www.firsttactical.com. You get what you pay for and if you're looking for a new tactical uniform, I think the Defenders are a great investment.